To be honest, I wasn’t appealed by Komodo cruise when I first heard about them. Before Komodo, the idea of travelling with boat has never been on the top of my list. I don’t really like being swayed by the waves—though it may sounds romantic for other people. While travelling awhile back in Bali, we made a short day trip to Nusa Penida which we did by small ferry boat. Crossing the strait was like a trip to hell. The boat was constantly swayed to right and left, the deck was cramped with people and stiff chairs, and the air was not circulated properly. I went to the back seat; part of the ferry just before the stern. The only part where we can sit in an open setting. Though I needed to endure splashes of salt water from the propeller (and got wet a little), at least I get fresh air to ease the nausea a little. Not a very pleasant experience, I tell you. Needless to say, I got traumatised. I even still feel the nausea when I wrote this. But then I heard of Komodo. I keep seeing fellow traveler posts beautiful birds eye view of yellowish hills with deep curved bays (which later I know as Padar Island, one of traveler’s fave in Komodo), providing a high contrast to the bright blue sea in the surrounding. 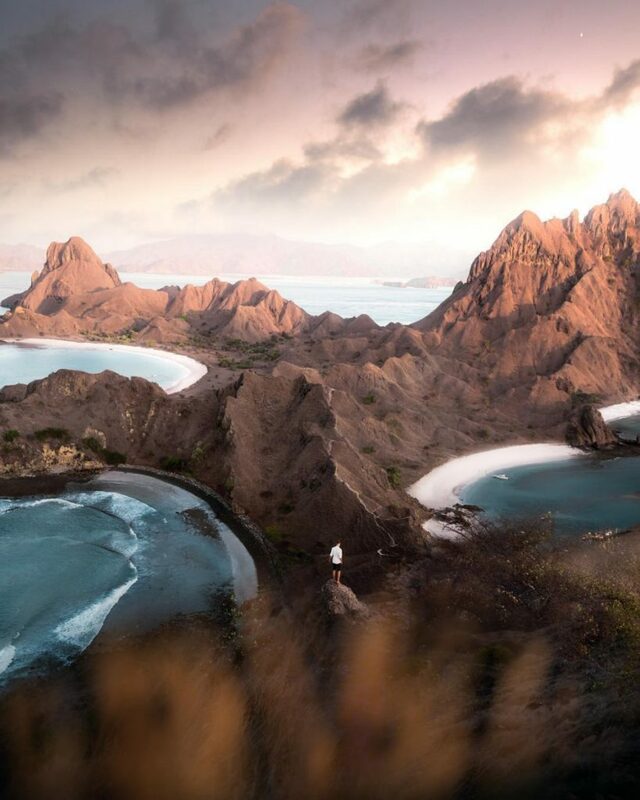 As if it was a universe conspiration, my Pinterest wall and Instagram feeds were constantly flooded by charming shots of golden hills, rosy tinted beaches (another Komodo’s main destination), scaly and ferocious dragons, jagged brown hills, and loads of aquamarine ocean that were too appealing to be ignored. Amidst the horde of Komodo’s natural beauty, travelers were busy sharing their leisure time in their Komodo cruise. They seems so happy to have relaxing sunbathing in the deck, and actually enjoying the scenery. Before I know it, I was deeply hooked. But here was the problem. 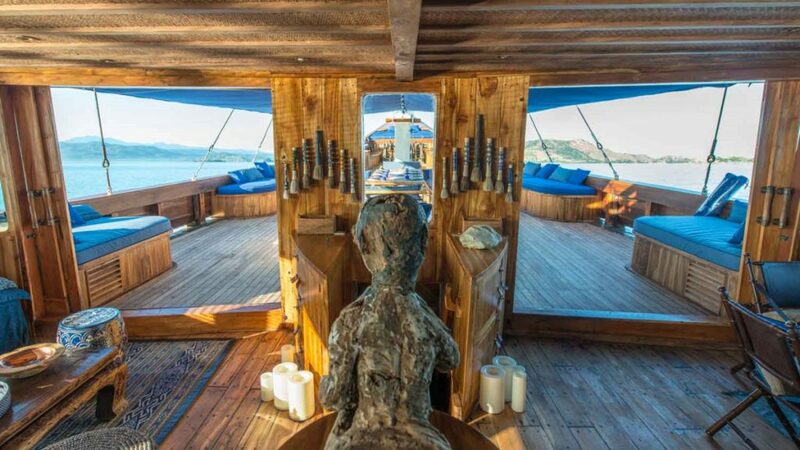 To have a trip to Komodo, I need to hop into liveaboard. And that’s not just a one-to-two hours boat trip, but a three day trip! While my heart longs for this far-flung paradise, my head kept replaying our terrible trip with ferry back in Bali. Can I stand the nausea? Will I really enjoy my time in the sea? Do I really want this trip? Until one day, I made the decision. A decision that forever change my soul. Unlike my previous trip to Nusa Penida, this time I got bae on my back. He kept reassuring me that everything will be okay, that Komodo cruise was far more enjoyable than a fast boat ferries. This time, I take seasickness tablets wit me. The next thing I know, we have booked slots for two people on Ocean Pure, one of the best Komodo cruise recommended by our friend. In fact, it was so good that now I’m considering a trip to Raja Ampat, Papua. So, I was still lingering in fear up to the moment when we were just about to see our liveaboard. It was when the liveaboard really sail that I realised I was okay. I didn’t want to throw up. I didn’t feel the seasickness. Maybe that’s due to the cruise’s body that were physically bigger than the ferry. Or maybe that was due to our captain’s skills. Maybe…it was because of the amount of creature comfort available on the cruise. I even fell in love with the interior of our ship—the nautical vibe made calmed me and made everything felt exciting at the same time! One thing I really love from the Komodo cruise is their lounges; both indoor and outdoor. The cushions were regularly cleaned, super comfortable to lie in, and actually made our leisure time enjoyable. For the first time in my sailing trip experience, I could actually enjoy watching the scenery. And oh boy, seeing rugged islands passed by without thinking about anything but admiring nature’s creation was truly a satisfying experience. Other things I love from the liveaboard were the rooms. Here we have our private cabin where I can retreat to our comfy bed whenever the I got too nauseated or tired from the trip. Something I definitely couldn’t do back in the ferry. Overall, it was a very enjoyable voyage. The trip itself was incredible. We got to see everything Komodo has to offer; the Komodo dragons, the Pink Beach, the phenomenal Padar Island, many wonderful dive sites, and other breathtaking places that would be my story for another day.